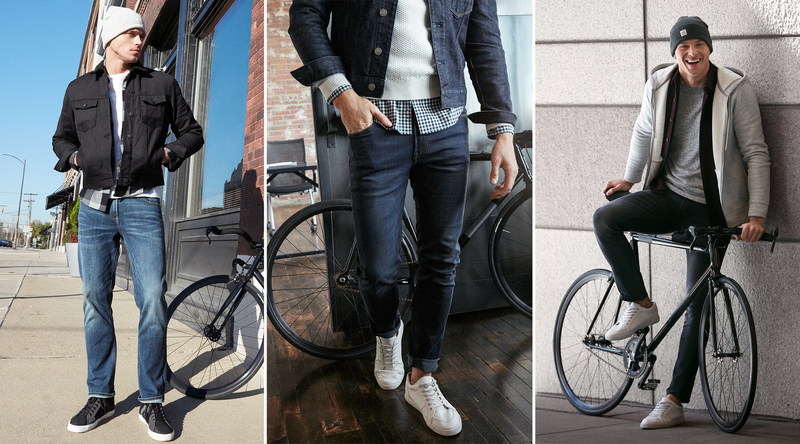 Finding the perfect pair of jeans is an art and a science. You want something that looks cool and is flattering on your body—whether you’re built like John Cena or Adrien Brody—but can also stand up to everything life throws your way, from running to cycling to reclining in all kinds of weather. In an attempt to check those boxes, we created our Tough Stretch+ Jeans, new for 2018 and just launched in Express stores across the country [cue a chorus of angels singing]. Hard-wearing, yes. Uncomfortable, no. We’ve road-tested this denim, and let us tell you: you can do just about anything in these puppies. They won’t tear. They won’t lose their shape. They even wick away moisture like your favorite gym clothes do. If you’re looking for something that toes the line between 100% cotton, stiff-as-a-board jeans (ouch) and too thin, too stretchy denim (leave the leggings at home, guys), these are just the thing. “They have performance properties without looking like they do,” Park commented during a walk-through of the collection. And by walk-through, we mean walk-though. Tough Stretch+ jeans are available in light, medium, and dark indigo washes as well as inky, edgy black. And there are a ton of different cuts, too—from skinny to slim to straight to classic. You can really pick your poison here. Or in this case, your perfection.